Voice control is one of the core capabilities of the Amazon Echo: the tall, black cylinder comes with a basic remote and some on-board buttons, but speaking commands and questions is the most intuitive way of interacting with it. If you’re wondering just what your Echo can do and which commands it responds to, here’s a comprehensive list. Weather forecasts are the bread and butter of smart assistants and the Echo is no different. Just ask for the current weather or a forecast using your voice. You can adjust the phrasing in various ways too, because something like “Alexa, will it rain tomorrow?” works as well. Your flash briefing is a round-up of pre-recorded audio updates from the likes of NPR, BBC and the Economist. Once you’ve used it for the first time, a card appears in the Echo app giving you links to the full stories. Use “next”, “previous” and “cancel to navigate your way between reports. Your Amazon Echo can tap into local traffic reports, enabling you to ask how your commute is looking (provided you’ve set up home and work locations through the device). More generally, asking “how’s the traffic?” or “how’s the traffic right now?” will bring you info about the congestion on nearby roads. Your sleek-looking Echo comes with a built-in timer and a built-in alarm, both of which can be controlled with your voice. Set alarms using the command above (“Alexa, snooze” can also be used when the alarm goes off) or say “Alexa, set the timer for 30 minutes” to start a countdown. If you link your Google calendar through the Echo app, you can ask questions and get information about your upcoming schedule. For example, you can ask what’s on your calendar tomorrow or say “Alexa, when is my next meeting?”. The device also understands specific times and specific days. Alexa can manage to do and shopping lists for you easily. Tell the Echo when you want to add something new to these lists (or just say “I need to...”) and then use the simple commands “what’s on my to do list?” or “what’s on my shopping list?” to have them read back to you. You can also get your Echo to add items to your online Amazon shopping basket (for new stuff) or reorder something you’ve bought previously (if you’re a Prime member). Of course it helps the process if the thing you want to buy can be spoken clearly and easily in just a few words. 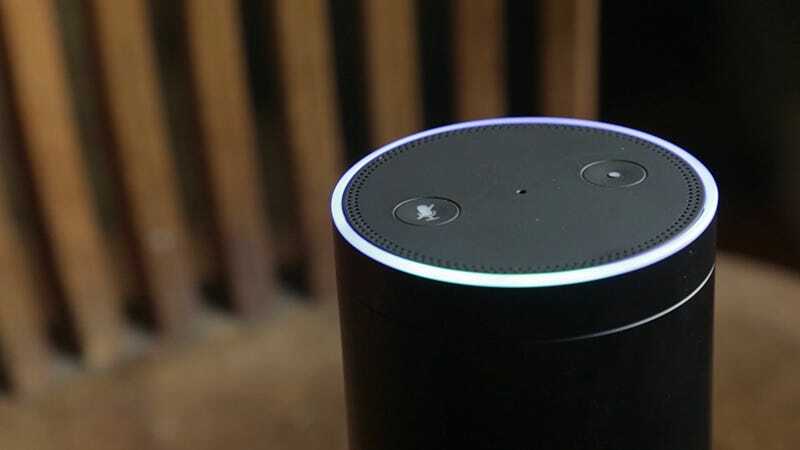 There are all kinds of ways you can use your Echo to play music from Amazon Prime Music and supported services like Pandora and Spotify. If you’re using another service, you usually need to specify it, whereas something like “play Submarines by the Lumineers” is going to default to Amazon Prime Music. Web search queries are supported too, so just about everything Google will give you a direct answer for works. You can ask for definitions, worldwide times, facts and figures, and so on. You can also just say “Wikipedia” followed by the title of the article you want to hear to have your Echo read it out to you. Amazon Echo knows plenty about local movie showtimes, and you can ask about specific films or specific genres if you want to. Say “Alexa, tell me about the movie The Revenant” (or whatever movie you’re interested in) to get key facts about the film pulled in from the web and read out loud. You can get Alexa to lighten the mood with a few quick jokes as well, though you may find the quality variable. If you have trouble hearing the joke, try saying “Alexa, turn it up” or “Alexa, volume eight.” The volume can be chosen from a scale of one to ten. The Echo can read out your Audible audiobooks and Kindle ebooks (though it’s often in a stilted, robotic voice). Use “next chapter” and “previous chapter” to jump around (or specify chapters by number). Other commands like “skip back” and “pause” are supported too. The Echo is compatible with a variety of smart home kits, including Philips Hue lights, Belkin WeMo gadgets and the SmartThings range from Samsung. Once you’ve got new devices added, you can control them through Alexa and the Echo using your voice. IFTTT integration is another available option. Your smart assistant can now tap into Yelp listings and bring you results, as long as you’ve added your home address through the Echo app. Ask for a nearby restaurant, for example, or check up on the opening hours for a nearby pharmacy. If it’s listed in Yelp, then Alexa can help you find it. Those are the main commands and their variants, but there are plenty more questions you can ask and commands to try. New ones are being added on a regular basis (like getting a Domino’s pizza or an Uber cab), and you can check out the Amazon Echo help page for more. If you’ve got a favorite command that we’ve missed then let us know in the comments.